The woman attacked a day ago in an ATM kiosk in the heart of the Karnataka capital sustained grievous injury and suffered partial paralysis. She will take six months to recover, a doctor attending to her said Wednesday. "The victim (Jyothi) is recovering from severe injuries on the head and face, and has suffered heavy loss of blood," BGS Hospital chief neurosurgeon N.K. Venkataramana told IANS here Wednesday. The bridge of the woman's nose was damaged in the attack. The 44-year-old manager of the state-run Corporation Bank's branch on Mission Road was in an Automatic Teller Machine (ATM) kiosk in the heart of the city when attacked by a masked assailant, caught on video footage with a 10-inch machete and a country pistol. She was shifted to BGS Hospital late Tuesday from the state-run Nimhans Hospital for an emergency surgery to remove a bone piece from her brain, as her skull was fractured in the deadly assault. "Jyothi's body is paralysed on the right side because of the injury to her brain, and she has partially lost sensory perception after the blood clot in the head. Full recovery will take four to six months, as the clot has to melt from the affected area," Venkataramana said. The victim was found unconscious in the blood-stained kiosk nearly three hours after the assailant escaped with her cash (Rs.2,500) and a mobile handset. "As she regained her consciousness and was able to talk slowly in a low voice, we did a plastic surgery to restructure her nose bridge, which suffered damage in the attack," the senior doctor said. The hospital advised Jyothi's family not to disturb her and keep away relatives and colleagues for at least a fortnight, as she is very weak and in a state of shock. "We also told police to defer taking her statement for the time being and avoid visitors as she has to be in the intensive care unit for at least 10 days to recover from the trauma she had gone through," Venkataramana, who is also the hospital's vice-president, said. No security guard was present at the kiosk when the horrifying incident took place, which sent shock waves across the city after the police released the CCTV footage to news channels late Tuesday for information or tip-off about the assailant from the public. "It's a miracle how she survived the attack and remained alive despite loss of blood for more than three hours before she was first rushed by a constable in a three-wheeler autorickshaw to the state-run Victoria Hospital as it was closer to the site of the incident," the doctor said. Police registered a case under section 397 of the Indian Penal Code (IPC), which deals with attempting to cause death or grievous injury while committing robbery or dacoity. 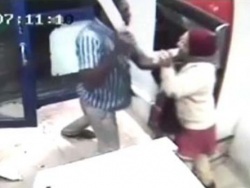 The footage obtained from the bank showed the unmasked assailant entering the kiosk when Jyothi was in front of the ATM to draw cash, and threatening her after downing the shutter from inside. "As seen in the footage, the assailant took out a country pistol and a machete from a shoulder bag and asked Jyothi to draw cash from the ATM. When she tried to escape, he pushed her into a corner and hit her on the head and face with a machete. After checking her bag, he left the kiosk, again pulling down its shutter from outside," city Deputy Commissioner of Police (DCP) D.C. Rajappa told IANS. The bank's ATM kiosk is located on the ground floor of the Life Insurance Corporation building, diagonally opposite the Bruhat Bangalore Mahanagara Palike (BBMP) head office in the Corporation Circle, and just about 200 metres from the Ulsoor Gate police station.